Ready for a mostly downhill race through the San Juan Mountains of southwestern Colorado, where there will be beer from 50 local breweries on hand to try at the finish line? Then you’re ready for the First National Bank of Durango Thirsty 13 Half Marathon, which makes its 5th annual running this summer. The race begins in the small community of Hesperus just outside Durango, a city of just over 16,000 in Colorado’s Animas River Valley, which is within a short drive of five major ski resort areas (including the popular Purgatory Ski Resort) as well as Mesa Verde National Park, where you can see the ancient cliff dwellings built by the Ancestral Puebloans, which date back hundreds of years. You’ll start the race at the Hesperus Church on La Plata Highway, after being bussed to the starting line from the area where you’ll finish the race, in front of Ska Brewing. 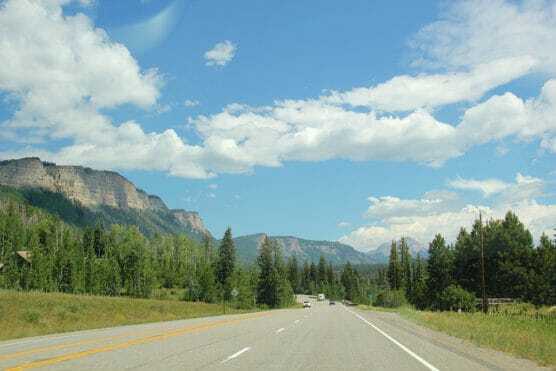 From there, the mostly-downhill point-to-point course descends some 1,400 feet as it follows 140 to Highway 125, and then to Highway 210, which takes you into Durango. You’ll pass by the waters of Lake Nighthorse along the way. Once you’re in town, then you make a few turns on city streets (Suttle Street, Turner Drive and Sawyer Drive) before turning onto Girard Street, which takes you in to the finish line in front of Ska Brewing. The only real uphill section of the race occurs around the middle of the course, where there’s a roughly 3/4-mile stretch that heads uphill. Most of the rest of the course features a gradual downhill descent, which flattens out in the final mile of the race through town. The course time limit is 3 hours and 15 minutes — the course closes at 11:15 AM — so if you can’t keep a pace of 15 minutes per mile or faster, organizers urge you to bring your own water with you. Nestled in the Animas River Valley of southwestern Colorado, just over 330 miles southwest of Denver, Durango typically sees August temperatures between the low 50s and the low 80s, and August is also its rainiest month of the year, with just under 2.6 inches of rainfall on average for the month. On race day (Aug. 25), the average low is 48ºF and the average high is 81ºF. See the race route map for the Thirsty 13 Half Marathon here. To reserve your spot in the 2019 running of Durango’s Thirsty 13 Half Marathon, register online at RunSignUp.com here. Ever run in the Thirsty 13 Half Marathon? Share your impressions here, as well as anything you learned about the race that you think other runners/walkers should know.